When I look around on any given day, I see mess after mess. Sometimes I feel like all I do is pick up toys, do laundry, and clean the floors. It can be tiring and frustrating at times. Maybe you can relate. But in the last couple of months, I’ve started looking at these messes as representing more than just another thing to clean up. If I look at the meaning behind each mess, I can find beauty in those messes! ~ Toys scattered across our living room floor are evidence that my son had fun! It also means that he is well loved because almost every toy was a gift. ~ Dirty dishes are evidence that my family is well fed. ~ Dirty sheets and blankets are a reminder that I have a bed to sleep on each night. ~ Loads of laundry mean that my family has plenty of clothes to wear. Back in October, I shared that I had started reading the book Love the Home You Have* by Melissa Michaels. It was her book that encouraged me to start thinking about my messes a little differently, and I’m so glad that I have! They aren’t just a burden or an extra thing to have to do. They all have hidden meanings. As you look around at your home, no doubt, there are messes that need to be picked up and cleaned. There may even be messes being made at this very moment! But what is the meaning behind them? It is also a reminder that you have people you love and you get to share life with them. The toothpaste in the sink is a reminder that you have running water and are able to brush your teeth indoors. 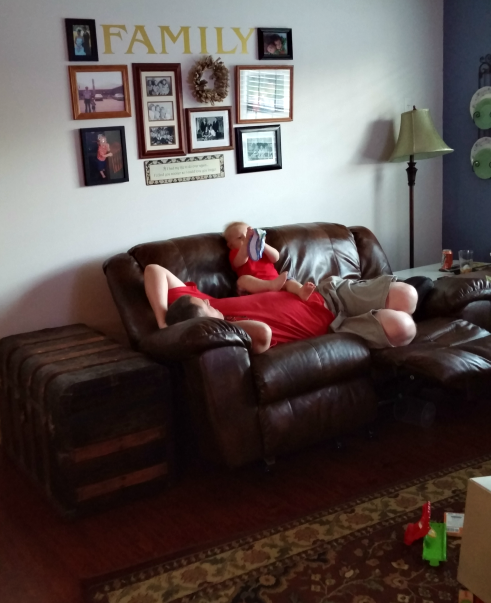 One evening after a long day of messes, I looked into my living room and saw my husband comfortably stretched out across the couch, playing with my son. I couldn’t help but smile and get a little teary eyed because that is what I want our home to be, a comfortable place for my family to live life and love each other. I want a tidy and nicely decorated home, but even more than that I want to love the people I share my home with, messes and all. This Christmas season, there will probably be lots of messes in your home. Look for the beauty in those messes! Why I’m the Perfect Mom (and so are you)! I love your inspiration. It's great to think like that instead of always wanting a clean home be thankful you have someone to make a mess! Have a great Sunday! Yes! When I focus on the people behind the mess, it helps me not get so frustrated over the mess. Hope you are having a great Sunday too, Vickie! It is amazing the amount of "damage" such a little person can make. 😉 Thanks for stopping by from TT. Love this mindset. It has been a process for me to work through embracing the mess. It can be so easy to only see the mess- thank you so much for this encouragement! Yes, it is definitely a mindset. I have to make the choice to see the beauty and not just the mess. I do too! I have learned to embrace the imperfection instead of setting myself up for disappointment when things don't look perfect especially my home. So well said and something I desperately need to remember more often. Thank you, Ashley. I need the reminder often too! What is it about socks that they seem to multiply!? They are all over our house too!